ATLANTA — The Georgia lawmaker who championed legislation allowing people with certain diseases to possess medical marijuana pre-filed a bill on Wednesday allowing state-licensed manufacturers to operate in the state, calling in-state production the "next logical step." Georgia Gov. 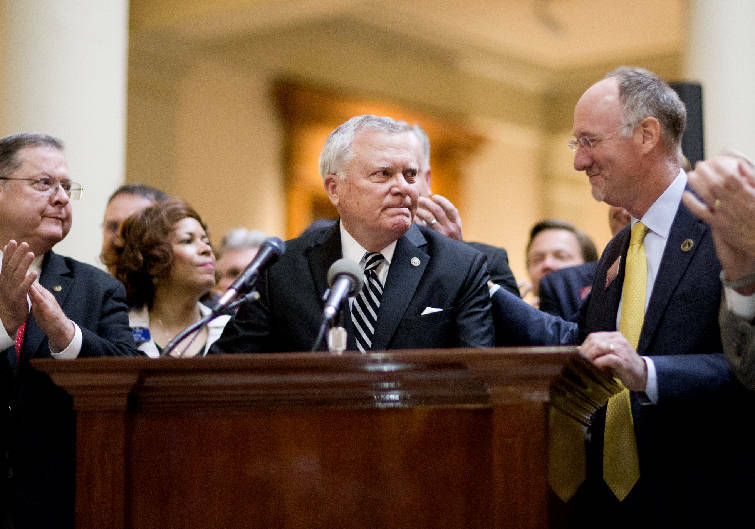 Nathan Deal, center, fights back tears while speaking after signing a medical marijuana bill into law as the bill's sponsor, Rep. Allen Peake, R-Macon, right, looks on during a ceremony at the Statehouse Thursday, April 16, 2015, in Atlanta. The proposal from Rep. Allen Peake, a Republican from Macon, would allow between two and six medical-cannabis manufacturers to be licensed by the state and serve people with certain medical conditions who are listed on a state registry. Peake said the proposal, modeled on Minnesota law, includes the creation of a state system to track all marijuana plants and products, and sets security requirements for the facilities. The proposal faces an uphill climb in Georgia. A commission studying the issue through the fall and winter voted down a recommendation backing creation of an in-state production system, despite Peake's urging. Law enforcement organizations long have opposed any legal growth of marijuana in the state. Republican Georgia Gov. Nathan Deal also has come out against such a system in recent weeks, prompting Peake to leave the governor's legislative leadership team. The issue became a passion-project for the certified accountant through two legislative sessions after meeting a young girl named Haleigh Cox who suffers from severe seizures. The legislation passed in 2015, dubbed "Haleigh's Hope Act," permits people with certain medical conditions and their doctors to possess medical cannabis. The law accomplished Peake's initial goal of bringing back Georgia residents who had gone to live in Colorado in order to be able to use cannabis oil. But Georgians who are now allowed to use it still can't legally buy it here, and either must travel at high cost or depend on a few companies willing to ship, Peake said. "Having access in Georgia is the critical point," Peake said. "Having access to a safe, lab-tested product that's consistent is crucial." Peake also cites support from top House lawmakers, including Alan Powell, who chairs the House Public Safety committee. Powell, a Republican from Hartwell, said the proposal sets strict standards for keeping plants and products secure and isn't a path toward the recreational use associated with Colorado's system. Lawmakers need to follow up on the law passed in 2015, he said. "We're not talking about every farmer who's got a poultry house that's going to start growing it as a secondary cash crop," Powell said. "We're talking about a very rigid process where there will only be a handful of licensed operations." Peake's proposal also increases the number of conditions allowed to obtain medical cannabis in Georgia to include autism, post-traumatic stress disorder, Alzheimer's disease and intractable pain. Peake plans to officially file the bill when lawmakers return to the Capitol on Monday for the start of the session.